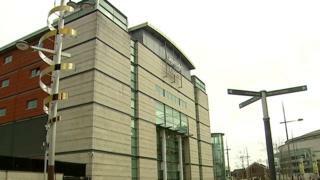 Two men have appeared in court charged with several offences, including human trafficking and arranging prostitution. Decebal Mihai, 28, from Kenlis Street in Banbridge and Spartacus Ilie Mihai, 20, from Henly Road, Ilford, in Essex, deny the five charges they each face. It follows police searches of properties in east Belfast and Banbridge on Thursday. Police said four women were rescued from the two locations - one in Belfast and three in Banbridge. The searches were carried out at properties on the Newtownards Road in east Belfast and at Kenlis Street in Banbridge on Thursday. A related search was conducted in London by the Metropolitan Police, but no victims were found and no one was arrested. At Belfast Magistrates Court on Saturday, police acknowledged that four women in the public gallery were the same people they'd rescued, and that two of them were the partners of the accused. The women were in court apparently supporting the two Romanian men. District Judge George Conner refused bail, saying there was a risk of the pair re-offending and interference with the inquiry. The two men will appear again in court via video link on June 19.